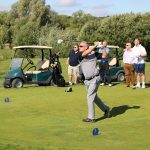 Our inaugural Soulstice Golf Day held at The Shire, London course in Barnet saw seventeen teams play for the Andy Weekes Memorial Trophy, help raise money for the Saving Soulstice fund & Cherry Lodge Cancer Care & enjoy a great day in the process. 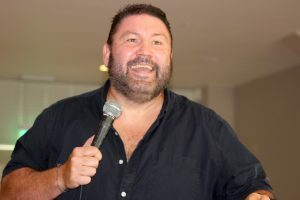 The event, which promises to be an annual tournament for golfers of all ages & abilities, was played in almost day-long sunshine on the 18 hole course designed by the late, great Seve Ballesteros. Everyone at The Shire were fantastic hosts & the club generously donated all the green fees to help us raise as much money as possible for our cause. 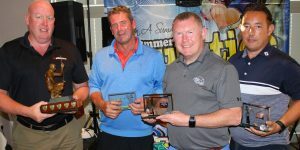 The trophy, eventually won by ardent Summer Soulstice supporters Team Artel beating Team Hanning all stars, a foursome that included former England football stars Razor Ruddock & Des Walker plus world boxing champion Ben Jones. The final play-off, played from the grass bank outside the club house, saw Artel’s Brendan Morrissey hit “the best shot of his life” to win the title. All our hole sponsors on the day, Ceri & all the staff at The Shire, London, Adrian Heesom (for the Sky TV prize), Will Norris (for the signed Wolves shirt), GDScore (for providing the live scoring), Fujitsu, Barclays, Tina & Sue (Cherry Lodge Cancer Care), Ray Fagan (for donating the trophy & hooking us up with funny man Ricky), Toppo – ably assisted by Liam Pratt (on Beat The Pro), Sharon Hall & Gemma Wilkinson (who oversaw the morning registrations), Jamie F (DJ/PA system) & last but not least, Maggie & Gilo for coming up with the idea & making sure it happened. Other teams which lined up: Less Tax 2 Pay, Swinford Contracts, The Blue Notes, ProClean Windows, I Like Big Putts, Team Fujitsu, Weapons Of Grass Destruction, Team Lynn, Smokey & The Bandits, Team Menezes, Misfits, Team Judkins, Team Crolly, Team Bernie & Team Oliver. Figures are not finalised yet & there are still some donations to come in, but all of us at Soulstice HQ are hoping the day gets close to it’s £5k target. For more info on The Shire, London please visit their website.